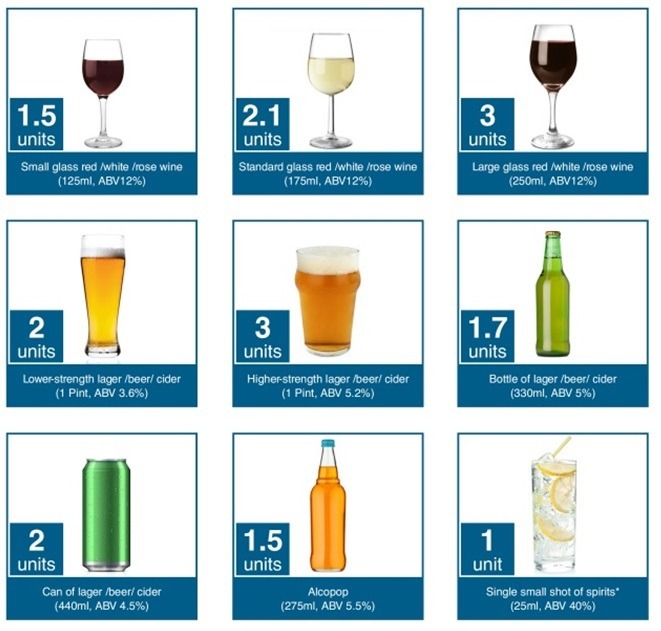 Most people will have heard of the ‘unit’ when it comes to alcohol consumption. The ‘unit’, first introduced the UK back in 1987, measures the amount of pure alcohol in your beverage. Units also establish upper limits of alcohol which are deemed safe for consumption, over which you risk health complications. You really don’t need to be close to admitting yourself into an alcohol rehab centre for it be worth investing in the time to learn about the alcohol unit. This alcohol units guide will help with this process. A ‘unit’ consists of 10 ml of 100% proof alcohol. A ‘unit’ in the US is about 77% greater than that defined in the UK. Typically, a healthy adult’s body takes one hour to metabolise one unit of alcohol as defined by the UK Government. If you are a man, the Government recommends you should not exceed more than 3-4 units of alcohol a day and no more than 21 units per week. This works out at about a pint and a half of beer (4% ABV) a day. For further information on drinks types see the alcohol units guide per drink type below. If you are a woman, the Government recommends you do not exceed more than 2-3 units of alcohol a day and no more than 14 units per week. This works out at about a 175 ml glass of wine a day. Women are advised to drink less than men due to less water in the female body which is available to dilute the alcohol you consume. A man can safely consume 10 ml x 4 units = 40 ml of alcohol daily. And a woman can safely consume 10 ml x 3 units = 30 ml of alcohol daily. Although the unit system is still of much use and one we adhere to in 2014, it does not come without caveats. Most notably the system was devised in 1987. As a rule of thumb, you may be told one glass of wine consists of one units and one glass of beer consists of two units. However, the UK alcohol market has been flooded with stronger continental beers and ‘new World’ wines since 1987 when the system was devised, all of which are likely to overshoot these estimates by quite some margin. Back in 1987 a glass of wine may well have been 8% ABV, but today’s variety can ship with a whopping 14% ABV. Do you know your ABVs? The alcoholic volume of a drink is expressed as a percentage of the entire drink sold. This is called ‘alcohol by volume’, or ABV for short. If a beer bottle’s label says it contains 4.5% ABV, the beer bottle contains 4.5% alcohol. And don’t forget to download our alcohol drinks journal. The journal will aid you in moderate your drinking efforts.